We are a family of tradition. Old ones from the days of my forefathers (this is what my mom tells me); ones created in my own childhood (the wife of an airman living thousands of miles from family my mom had creative juices flowing all the time); now traditions that I am creating for my own children. Tomorrow, as is tradition each December 1st, our Elf comes to visit! For a number of years he has been visiting and he moves around the house each night. Who knows where he is going to pop-up next. Each morning my boys get up excited to figure out where the Elf has moved. Enter the beauty of Pinterest! There are SO many creative moms out there. My hat goes off to each of you that make life for your children fun, exciting, treasured. They say the greatest form of flattery is imitation so as my little elf travels around the Kocsis Household this Christmas Season consider yourself flattered. This year's elf may be a little more conniving though. A little more crazy. He lives life on the edge making snow-angels in sugar or perhaps flour, painting the boys' noses red, perhaps even wreaking havoc on some coloring books. I'll be sure to record his travels and report back to you. It is going to be an exciting Christmas Season. Here's to Traditions - Old and New! by the front door. That had to hurt! The Elf was in the underwear drawer! Peek-A-Boo --- I see you! Our calendars are there to remind us. Sometimes they say it is time for an appointment, or a vacation or maybe a weekend getaway. For military families they can mean the return of a loved one or the day they depart (hardest one maybe) for a mission or deployment. Today our little family calendar reminded us that 10 years ago today I had picked up a new brand new C-17 from the Boeing Long Beach California plant. It still had that brand new smell to it – like a car but without the leather. We landed to a bit of fanfare at McChord AFB with each new C-17 but tail number 0178 was special for us. I had flown for most of the 30 years I served and later that last mission was into Afghanistan (yep another marked calendar event) but the new aircraft was a great way to look back at a calendar full of events. Since then, I am sure that tail number has moved injured troops to a hospital; airdropped supplies to starving Afghan families; provided relief supplies to Haitians after their earthquake; equipment to Japan after their tsunami damaged nuclear reactors sent radioactive wastes into the water and air; took in the mail to US Embassies around the world or carried supplies for our troops engaged with enemies in locations not even in the news. Meet the Ortegas, MilitaryAvenue's Nomination for The Home Depot Foundation's Gift of Good: Vote for them. You can help make this military-family's needs a reality. You can vote once every 24 hours, be sure to join us at Facebook.com/MilitaryAvenue so that we can remind you to vote each day. This Army Family deserves the "Give the Gift of Good"
"...our nominee has a great opportunity to win the $20,000 home makeover from the Foundation..."
We are very excited! 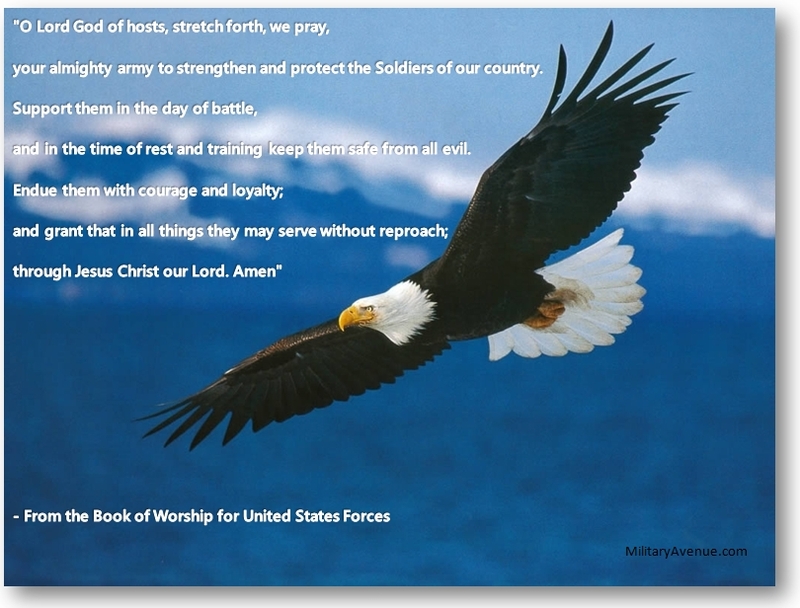 We have a specific mission to support our military community at MilitaryAvenue.com. Our efforts have been rewarded with a sense of accomplishment, smiles and appreciation. But today we are just ready to tell the story of one Army family and our effort to identify a military family for a home makeover from the Home Depot Foundation. We have started our mission with the selection of the crew! MilitaryAvenue has reviewed all of our entries for the HD Foundation, “Give the Gift of Good Contest” and selected our military service member participant! We earlier announced that MilitaryAvenue’s “Our Letters to You. 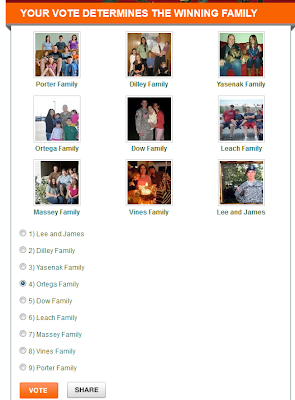 A Military Family Blog” was one of nine bloggers privileged to participate. So our nominee has a great opportunity to win the $20,000 home makeover from the Foundation during the next 11 days beginning at midnight tonight. But let’s get to know them! Popsicle Sleds: simple fun for a young one to put together. Ideas for children to use to create a memory that mark each year on the tree are great to catalog. This sheet of paper was tucked in an ornament bin, ready to share or use with some tree trimming youngsters! Kids and Christmas... they just go together! Because the sheet is old, I typed the words for easier viewing. However the design for the popsicle sticks are easy to replicate. Materials needed: Six inches of gold or silver thread like cord, seven popsicle sticks, paint, paint brush and glue. Cut sticks as outlined on right. #1 is placed on the top, and will have name on it. #2 and #3 are shorter and go on top also. #4 is on top, and needs holes for the cord. It will have the year painted on it. #5 (need two of these) goes on the bottom. #6 and #7 are the runners on the bottom. Glue pieces #1, #2, #3 to #5's. Attach to the runners (#6 and #7). Let dry. Turn over and Glue #4 in place. Paint and add cord in holes with knots to back. Personalize by painting the person's name down the center of piece #1. These make nice tree ornaments or package trimmers. Have fun with these! You will see them for years to come. I was browsing Pinterest.com last month looking for an idea to use on Thanksgiving day. Each year, after dinner the Moms and tots let the Christmas spirit enter our thoughts with a homemade project. Simplicity is number one priority, as we are tired, full under the influence of a ton of turkey and boat loads of whipped cream. Those who attend, sail to the table with languid interest, yet each expect to come out with a DaVinci masterpiece. But it is fun. It is time to laugh at ourselves, try something new, pick through beads, choose twigs (that have been pre-drilled) and create a masterpiece... or at least something tangible. And each year we love it. Whatever 'it' is. A new decoration is ours. 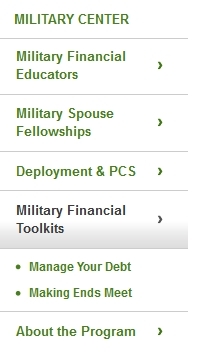 Have you visited the website from FINRA Investor Education Foundation for military families SaveAndInvest.org? It is developed specifically to help us better manage money such an important topic this time of year and progressing into the new year. They have re-launched with new content, action plans, worksheets and videos. Here is a link to the press release. Topic areas include digging out of debt, making ends meet, planning for the future, managing financial products and avoiding fraud. 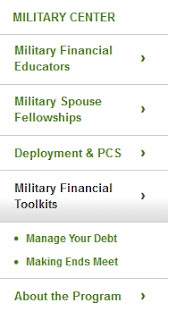 Debt and credit information is particularly important for military families; research by the FINRA Foundation found that more than a quarter have $10,000 or more in credit card debt. As the leftover Thanksgiving turkey is down to turkey salad, Christmas decorations are hauled from the closets. Boxes, cartons and plastic bins hold memories, treasures and herald the coming holiday. The last plastic bin was rifled through hoping to reveal perky Christmas towels. There on the bottom, as if an afterthought was a sheet of typed, well copied paper from Keflavik Naval Air Station's PWOC about Christmas tree history. A paper reminder of good times, great ladies, strong values: military spouses of all services and NATO nations. The entire MilitaryAvenue.com Team extends a happy Thanksgiving to you and your loved ones! What are some things MilitaryAvenue is thankful for? First and foremost, we are so very thankful for the people that work so tirelessly at keeping us safe. The Marines (OORAH!) , the Soldiers (Hooah! ), the Airmen (HUA! ), the Coast Guard (Oorah! ), the Sailors (Hooyah!). We will say a special prayer at dinner for the families that stand behind the troops; especially the spouses and the children. But we won't leave out the mothers, fathers, aunts, uncles, cousins, grandparents and even grandchildren. Thank you to each of you for standing behind /your/ Service Member, remembering what they need throughout the year, physically and mentally. We would be remiss if we didn't mention the organizations that support the military family. Groups like: The Home Depot Foundation, SitterCity, USAA, Sears, The Mission Continues, the Bob Woodruff Foundation, Volunteers of America, Home Base Foundation, and each and everyone of our MilitaryAvenue Partners. EACH of these businesses holds a special place in their heart for you the military family. You are the reason they stretch out their hand and say "Thank You" in so many ways. There are so many things that can affect the simple beauty of this upcoming day of Thanks. Distance - physical and mental - can put such a damper on the day. If you need help please be in touch with Military OneSource. They have 24/7 help. 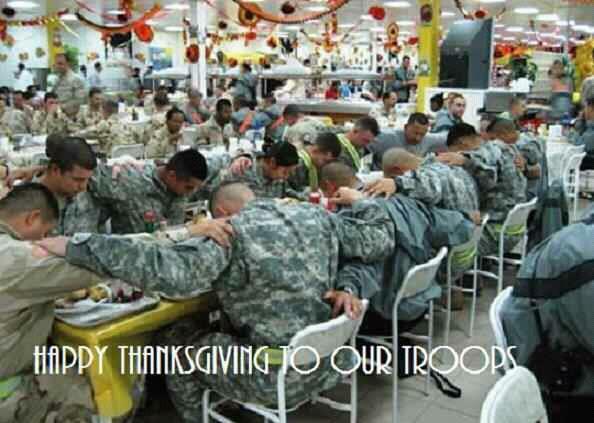 Even the troops around the world are enjoying a fabulous meal of Thanks. To all our service members and their families: Have a safe, healthy and Happy Thanksgiving! PS: We have a few giveaways up our sleeve coming in the month of December. We love all the opportunities we are afforded to say thank you, through out the year. Stay tuned! The last division in Iraq should be home for Christmas! That is the goal of military leaders. After almost nine years of war in Iraq, the less than 20,000 troops still there are getting on planes and heading home – the 25th Infantry Division based in Hawaii is the last major unit in Iraq and as the New Dawn stage of the war prepares to transition the last 7 bases to Iraq (6) and Department of State (1) control. A new relationship is beginning with the New Year! U.S. Army Brig General Bradley Becker said a plane full of the division’s troops landed in Hawaii last night. The pace has been hectic – more than 39,000 troops were in country as of October 24th, less than a month ago. At the height of the surge in 2007/2008 there were 165,000 service members in Iraq on 505 bases. The pace picked up when the President announced that the U.S. and Iraq had agreed on a final withdrawal of all troops. This was the last DoD Blogger Roundtable session from Iraq! A big shout to the Defense Media/DoDLive folks for keeping the bloggers engaged with the commanders and leadership in Iraq. Tomorrow is Grandparent day in my 1st graders class. Can you tell we aren't near a military base? Clearly, this isn't something I grew up with when I was in 1st grade, stationed at Sheppard AFB thousands of miles from either of my grandparents. My first grader is fortunate. His Grandpa and Grandma Kocsis live close enough that they are going to join him in his class for the morning. I am filled with a sense of love. Then at the same time I have a sense of some sadness. My parents (his Grandpa and Grandma Kissinger) don't live close. They don't get to see each other often enough in my book and this Thanksgiving does not involve a road trip for our family. The holidays can be hard. When we are apart from family, those that we love, our parents, our children, our own spouses, whatever the case may be, it can leave us feeling a bit stormy, filled with raging emotions of joy and sorrow all balled up in one. Mrs. G had sent an email asking for parent volunteers who would be willing to bake for the special day, Grandparents Day. I love volunteering for the class, in any way possible. So I replied with a 'Sure Thing!' The next day a recipe for "Thunder Cake" came home. I did a little research and learned it is from a book. A crowd fills the house at Thanksgiving each year. Chairs are mixed and matched to heights of a child's lap. Tables are added domino style... fitting this end, turning a corner with several tablecloths draped over them. My table is a center point of the Thanksgiving action for me. For me. Now, for more than half of us it is the Macy's Day parade which spills into football. Hors d'oeuvres fill the gap from the yeasty breakfast rolls or bowls holding fruited steamy oatmeal to dinner. A steady aroma of turkey feeds an appetite that nothing else can satisfy. Our menu has turkey highlighting the table at 2 P.M. and also a quick 5 P.M. homemade bread and slices of roasted turkey for sandwiches. Therefore 2 turkeys are in order. No question that those requirements have to be met. Food, it is a love language which speaks of heritage, tradition and togetherness. Then comes the day after... some years we have turkey. Travelers are leaving, no desire to pack a lunch leaving an extra 3 or 4 pounds of 'the bird' asking to be prepared into something other than a repeat performance. Here is where turkey salad is a kiss of simplicity and a reminder of summer days of salads and sun. Turkey salad with fresh vegetables is crunchy, naturally sweet and healthy. A great way to use those tiny pieces that fall apart on a sandwich. Serve with a side of toast, or a tomato, this is a break from potatoes or pasta! She came from behind the door – Looking for her partner, her sparkling eyes find him, she raises her arms, a smile, almost a laugh on her face and begins The Happy Dance…. a combination of tap, ballet and boogie with music supplied by her heart. The audience in the lobby (despite being strangers, each and every one) knows the reason for The Happy Dance. Many are hoping for a chance to feel the same elation for themselves or their family member in the room too. Their turns must wait for the same wonderful doctors and technicians to provide care. She was a survivor – a breast cancer survivor. Six years ago we had a battle for sure. The early warning radar picked up a blip and it was a definite bogey (bad guy) and we responded with everything we had – we called in the US Air Force, Navy, Marines, Army and Coast Guard of the medical community. We had a rapid response force of radiologist and surgeons and chemotherapy and radiation specialists to back them up. The commander (oncologist) was the best we could find for the mission and we did look and receive second opinions. We had family (mom and her sister, an aunt) who had a delayed response due to early warning failures, slow support and less lethal back up. The bad guys, the breast cancer cells had won and we knew the risk. MilitaryAvenue is always looking for new resources for our military community! Last Friday, on Veterans Day, I met some patriots and fellow bloggers who I think you might find interesting and helpful. Enthused, caring and smart, their excitement could be felt during our get together and the project. Hard working too! So they have information to share and stories to tell that just might get you over a hump day or help finish that bathroom project you have been waiting to get started on! EVERYTHING tastes better with bacon as the saying goes, right? Sweet potatoes, thyme, and bacon just proves the point. 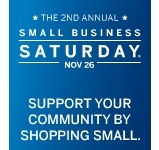 I am really intrigued by this idea of "Small Business Saturday". The premise is the Saturday after Thanksgiving you go to your local family-owned, small business stores to do your Christmas Shopping. "Orange" Cares about our Veterans! Thank you! "Fantastic Military Support!" The Home Depot is pleased to announce a contest through MilitaryAvenue to find a deserving military family home for a $20,000 Home Makeover. "GIVE THE GIFT OF GOOD"
WHO: Do we have your attention? Home Depot wants us to select a military family with home upgrade needs. Whether Active Duty, National Guard or Reserves, or a Disabled Veteran let us know how Home Depot could make your house more of a home. Getting pumped up for Volunteering and "Give the Gift of Good"
Volunteer; it is good for you! Veterans Day was a special day for veterans and their families! The outpouring of support from businesses, friends and family was impressive. MilitaryAvenue was invited to a very special event in Atlanta by the Home Depot Foundation. The Quest 35 project was exhilarating and left participants with a few sore smile muscles (maybe a back or two as well). The project is now a better living space for low income families and a future home for homeless veterans. The HD Foundation end their "Celebration of Service" veterans' projects ended on Friday with an awesome 320 projects between 9/11/11 and 11/11/11. Wow, their goal had been 200 and the enthusiasm I saw at three of them just made me proud to be an American. But their efforts do not end here; no, they continue their outreach for homeless veterans and are on track to spend their $30 Million in 3 years on veteran projects. Did you catch the number? $30 Million. So when they invited us to participate with 8 other bloggers from the military and DIY (due it yourself) communities, we jumped on telling their story in Atlanta and then they surprised us with a gift for you! As part of "Give the Gift of Good", MilitaryAvenue received a $500 gift card to give to a military family for Christmas and other needs! But there is more … much more… Can you guess how much they want to give you for a home improvement project? Maybe not; but lets just say, it is a wonderful gift to a military family in need of repairs or new updates! $$$$$ Still interested? Do you receive our MilitaryAvenue family newsletter? The newsletter will be published tomorrow with details of "Give the Gift of Good"! Not receiving our newsletter but want to hear the awesome news in the morning? Do you know someone that so needs a housing renovation? Sign up for the MilitaryAvenue newsletter to get the details of the contest tomorrow! Be sure to nominate them and we can be a help! The winner at MilitaryAvenue wins at least the $500 gift card! Plus … find out tomorrow on the newsletter! Isn't it fun sometimes to just not be serious about yourself? I take myself too seriously sometimes. Dinner preparations, school work with the kids, household to keep straightened (I can't even begin to keep it clean), a husband to keep track of. 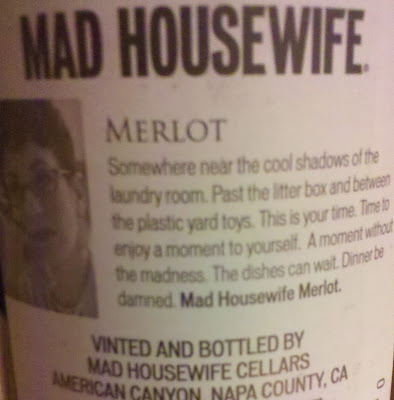 So when I ran out to the grocery store this afternoon to pick up staples for the week (after my usual Sunday afternoon menu-planning) a bottle of wine practically jumped into my cart. 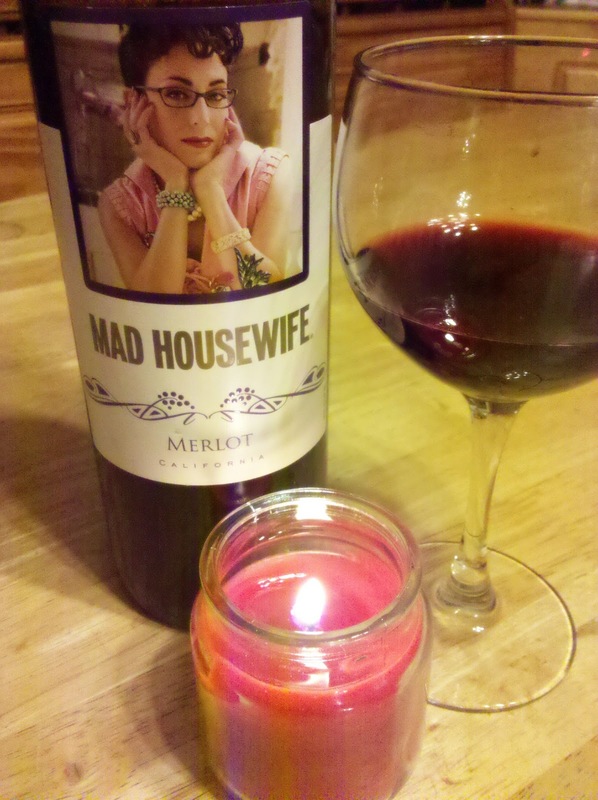 I had a glass this evening with a great big grin, a cheers to me --- mom, spouse, Household 6 --- all while remembering that sometimes it sure feels good to take moments for myself. I hope you can do the same. By the way, here are some great ways to take time for yourself: Taking Care of Yourself is NOT Selfish. Goals and principles, guidelines and pathways; no dice to roll or spinner to click but a level headed approach to an end game. Those who enter the game plan of The Mission Continues come with heart in hand, a desire for direction and a dream to be attained. Recovery from injury is not a cake walk. The time it takes to heal is not laid out in blocks with an easy view to end. But the desire to get in the game is real with each member of the group. And each member has their own story, a true character and a real life. Let's get started! Enter Sister Elizabeth, a novice with the Palatine Missions working with the Renewal Center in Florissant, Mo. and The Mission Continues. She is a USAF veteran. Her leadership in The Mission Continues is to assist veterans who have applied for a fellowship. These perspective fellows meet with Sister Elizabeth to answer the question "What do you want to do?" Veterans are independent, discerning and want to be where they best fit. Among veterans there is a bond, a common language and connections: a trust that unites and supports. It is that time of year again. Festive lights, decorated Christmas trees, homemade treats and the celebration of traditions with the promise of a bright future. It can also be a very stressful time of year. The focus has become retail. We spend our time fretting about the 'perfect gift', the 'perfect meal', the 'perfect ensamble' for the brigade or unit party. All of this when we should instead be focusing on what the holiday is about. We have found joy in spending, getting the biggest, best, most luxurious. The worst of it: the stress lasts well into the new year when we overspend, don't budget and simply spend on impulse instead of planning. Want some simple tips on taking a bit of the stress away? Veterans Day is fast approaching and it is a day for our country to celebrate the lives and service of our veterans. They continue to impact our communities, our states and our nation as a whole. Some return from their tours of service ready to serve their local, state or national government in numerous ways, as business leaders, parents, students, role models and much more. But some return with injuries, both visible and invisible, and need assistance to reach their goals, become part of their communities, do those things most Americans take for granted, like driving a car. The DoD Bloggers Roundtable talked with one of those veterans, Maj. Ed Pulido (U.S. Army, retired) as he shared his story about combat in Iraq and the IED that injured him, the medical system that saved his life with a helicopter medevac, front line surgery, fixed wing medevac to Ramstein Air Base, then Walter Reed and finally Brooke Medical Center. He described his critical injuries, the role of his family, doctors, buddies, mental health pros, chaplains and others to mitigate his injuries and keep him alive. Then the struggle with depression after the removal of his leg, the night sweats, Traumatic Brain Injury, post traumatic stress and how early on intervention saved him. An inspiring story for sure, but Ed said his goal by telling it was to “Inspire Others to Seek Help” as we approach the day Americans say or should say “Thank You”! We know from personal experience the sacrifices of a veteran. That is why we are excited to be able just a small gift of appreciation from our good friends, and military-supporters, Home Depot and Sears. We also have some beautiful gifts from a-zphotogifts.com. If you are a veteran or the family member of a veteran you don't want to miss this opportunity. The Mission Continues therefore there are veterans who are breathing, conversing, working, regaining courage and are part of a stronger community. What is required? Effort, drive, desire and a dream: the ability to answer what can I do to help others? Amanda, a Fellow with Mission Continues, stated a common ‘heart hurting’ grievance: the knowledge that ‘my guys’ were still in combat while she had been medevac’ed home. She no longer had the bond of her unit and she was out of the mission. What she did have was depression, a sense of deep loss and separation. Then, she found her dream. To be part of a community requires involvement, trust, a common language, a shared goal. Those who have completed their fellowship at Mission Continues have grabbed a dream, contacted an organization, worked for 28 weeks in a position within their chosen nonprofit. Even though they left the battlefield, taken with them disastrous disabilities, visible or not, a Fellow has reached beyond them self and has entered a new community. A few years ago hubs was in Iraq and I was the temporary-single mother of three boys. I am now a sometimes-single mom of four boys and life has forever changed since Iraq for our family. There was a recent amicable discussion amongst friends about the needs of grants and scholarships and such when the soldier is off in a war zone. A lot of times the pay is a bit higher because of the danger they are in ... so is there really a need for great organizations like Our Military Kids, or free YMCA memberships, or other financial support? My answer? A resounding YES! Life was busy. But American citizens wanted to support my family. Groups like Our Military Kids recognized that active kids are happy kids (Deployment Troubles of a Five Year Old). I wanted to be a part of that. I was more than thankful for the support we were given and ultimately it helped me be a better mom, a better spouse to a soldier (less stress at home helped him focus on his job overseas), and really it made me feel better about myself (knowing that I was capable of raising happy, balanced children reflected on my own self-esteem)! Thank you, from one very proud military-spouse raising another generation of great military-kids! Staying balanced for so many reasons! Well, I was off kilter all night. Couldn't figure out what time it was...ugh. But it reminded me that the kids do not come to hear me, or come to listen to what I say... but come because they want to be there, be with each other, and enjoy being in church... so, tonight, the lesson was for me. I learned. I'll be off kilter the next time it happens too probably, but that's OK... I'm not the reason for the night! Life's lessons, they just keep coming and for that I am so grateful. We continue to highlight the efforts of our veterans to protect our freedom and illustrate why we celebrate Veterans Day! A ceremony in the nation's capital will honor a special group of American veterans from WWII tomorrow. Many of us do not remember the fear after the Pearl Harbor attack of the possible invasion by Japan. I remember my grandparents and parents speaking of it fiercely. Orders followed to intern Americans of Japanese descent in camps as a response to this fear. Imagine those Americans' feelings! Originally, some service members were released from active duty, many had families in internment and yet they were again ask to serve their country. How in those circumstances could they have served? But serve they did; and tomorrow their units will be honored with the Congressional Gold Medal to recognize their special service with the 100th Infantry Battalion, 442nd Regimental Combat Team and Military Intelligence Service. Need ideas how to Thank a Veteran? Go to 101 Ways to Thank a Veteran! Photo Credit: US Army Two color guards and color bearers of the Japanese-American 442d Combat Team, stand at attention, while their citations are read. They are standing on ground in the Bruyeres area, France, where many of their comrades fell.